Summer is here. Time to get the grill hot. Time to step out in flip-flops and shorts. Time to jump into the swimming pool to cool ourselves and yes it’s BBQ time too!!! Last Saturday we invited our friends for a cook out and S, the BBQ expert was ready in his aprons and tongs to get the party rolling. Indian style chicken thighs, spicy corns, caramelized pineapples, roasted tomatoes, onions and eggplants for the summer salad and chocolaty-peanuty banana for dessert was the menu on the block. 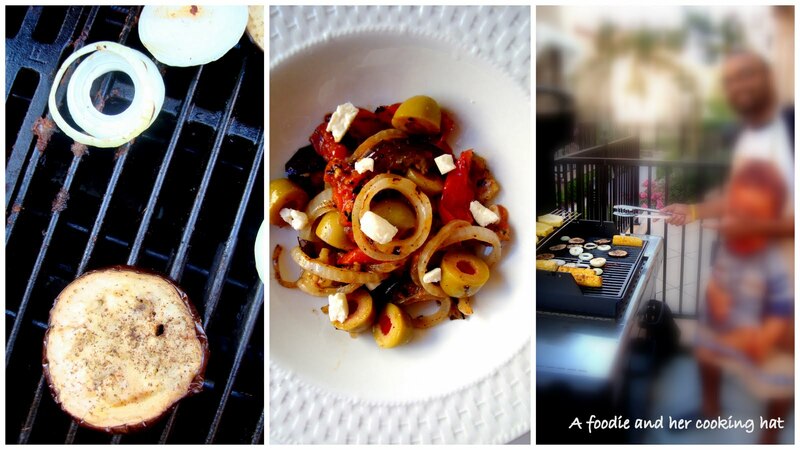 I skipped the diet for a day as I couldn’t resist myself from tasting these yummy dishes. We had a lovely time, the weather and my little prince were so cooperative 🙂 and on the whole, it was a fantastic evening of fun and laughter. This summer salad is so colorful and inviting to the eyes. 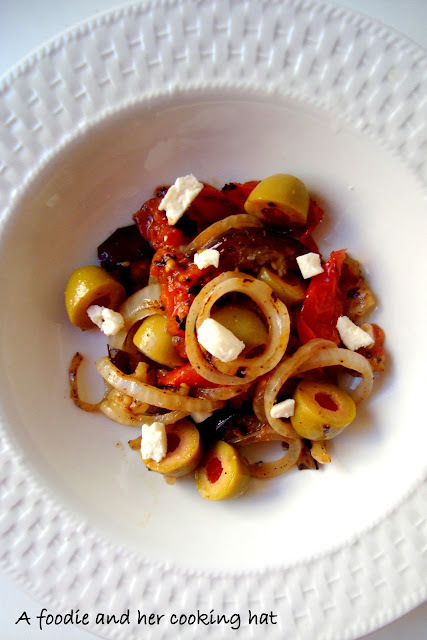 Juicy and sweet tomatoes, salty olives and mildly charred eggplants blends so beautifully with the caramelized onions. Smoky veggies and tangy cheese is something I love to combine. Finishing off with a lemon-olive oil vinaigrette convinces me that even simple dishes can taste exotic and this salad is sure to surprise your palette. Pre-heat the gas grill. If using 3 or more burners, just turn the 1st and 2nd on for 10 minutes. Once hot enough, grill the veggies over direct medium -high heat. Cook for 10-12 minutes, turning once. Look for the grill marks on the veggies and check for yourself. Cook till done. Remove and set aside. Once they have cooled down to room temperature, dice the eggplant and tomatoes into small cubes. It will be sticky, so be careful when you chop them. Place the onions, eggplants and tomatoes in a large bowl. Throw in the olives and pour over the olive oil. Mix with salad spoons. Sprinkle salt and pepper and mix well. 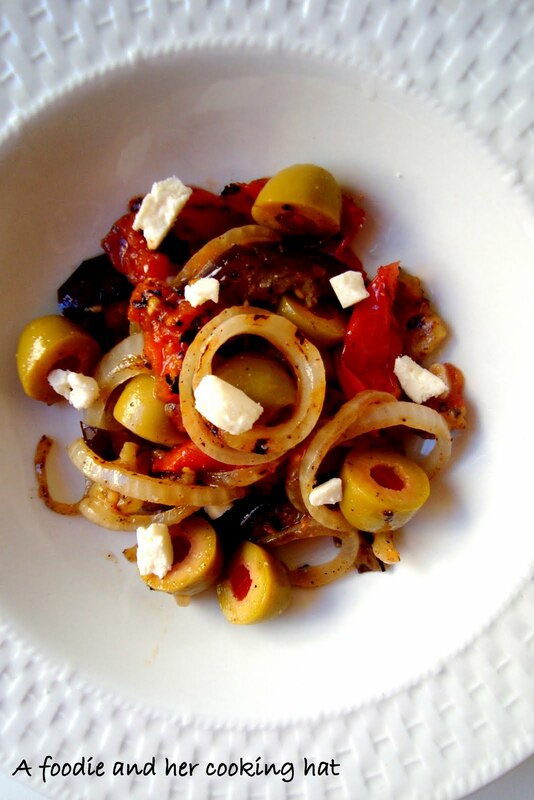 Before serving, garnish with feta cheese. 1. This is a perfect salad for all the phases of South beach diet. 2. You can refrigerate the salad before adding the feta cheese for 2-3 days. Microwave the veggies and then sprinkle the cheese before you serve. Yum, wow, that sounds superb !!! Salad looks flavourful,colourful and interesting..
wow this is so perfect ..
Lovely recipe.. Looks colorful and tempting.. Delicious !!! We are planning to buy a grill. Can't wait to grill my vegetables and fruits. And the salad idea sounds fantastic.